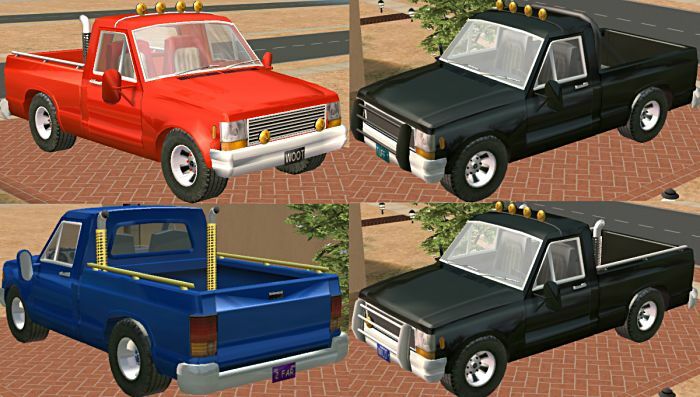 Nobody will mistake your Sims for the gardener when they arrive in this pickup customized by Honest Doc's Auto Body. It features a new grille and off-road alloy wheels. Complete the look with your choice of accessorys. You can choose several accessory sets using the second color option - included are off-road lights, a rollbar, big-rig style exhaust pipes, foglamps, a brushguard, and bed rails. This is a drivable vehicle - The Nightlife expansion pack or Numenor's Drivable Cars Without NightLife Mod is required! Updated December 2008 to be compatable with Numenor's Drivable Cars without NightLife game mod. This mesh was edited using Wes Howe's v2.16 MilkShape plugins. Based on the Maxis Pickup from the NightLife Expansion pack. Credit to Wes, Quaxi, Miche, and Delphy for creating the tools needed to allow me to do this and to Cevic, Vampcat, and Pinhead for information on the vehicle files. 100th Car Anniversary! BIG Celebration-BIG Downloads!